With this article, we will try to make a complete Fujitsu Fi-7160 review. At this moment, this is our favorite scanner under 1000$. The Fujitsu Fi 7160 price? Somewhere around 900$. That is a steal for the performance it offers. Seriously, we tried other scanners, from different manufacturers. This just works better. 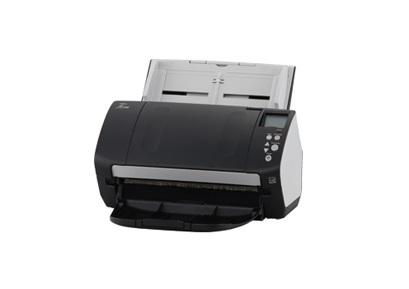 And best of all, you can find the FI-7160 on Amazon at crazy low prices from time to time. 2 The Paperstream IP driver, the soul of this scanner. At 60 ppm per minute, the scanner is not lightning fast, but it’s not slow either. With this speed, you can easily capture around 10.000 documents every day. I know Fujitsu rates it for 8000 documents per day, but going above that value by 20-25% will not affect it too much. Maybe you will change consumables a bit more often, but they’re not expensive either. The ADF size is definitely not big and for production environments, it seems too small. But, the major advantage of this ADF is actually the continuous loading feature. Because you are scanning face down, you can permanently load the scanner while scanning. This proves perfect for batches of smaller size or for environments where preparation and scanning are done at the same time. You would not be blamed to think this makes the ADF size irrelevant. These CCD capturing units that the FUJITSU FI 7160 is using are nothing short of the highest quality. In the past, Kodak scanners were renowned for their capturing units. Well, I personally think that quality wise, Fujitsu is above Kodak at this moment. The quality of the scans is so high, that for some scans you would think it is actually a master file. Even for glossy scans, there is almost no visible reflection. This, for example, is still a problem for Kodak scanners, even for scanners over 5000USD. One good feature Fujitsu uses to avoid such a reflexion is a diffused LED light. It’s not cutting edge, but it’s a good solution to a big problem. The implementation is very good and solves the issue. The Paperstream IP driver, the soul of this scanner. At first glance, Paperstream IP is just like any other driver. It has an ISIS and a Twain driver. 32bit and 64bit driver. But here are just about where the similarities stop. This driver is so far ahead of the game, that even a 50.000 USD Kodak machine can’t compete with it. I work with a lot of scanners and different drivers. What Fujitsu does with the Paperstream IP is to standardize the driver all over their scanner range. Whether you spend 15000 USD for an FI 5950 or 800 USD on an FI 7160 the driver is the same. Yes, there are extra features here and there, but the core is there. And the variety of settings is just insane. You don’t know where to start with image modes. I will show you for the Automatic Color Detection and the multitude of options you can have. And remember, this is not multistream. 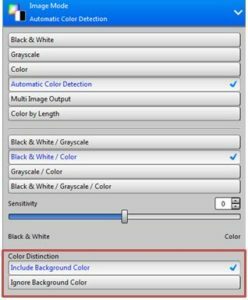 This is automatic detection fo color. You can actually select just about any combination you can think of. For most scanners the selection is limited. We love that you can combine Gray and Color, but most importantly that you can combine Gray and Black and White. The assisted scan feature is also quite cool. You may have seen this with other manufacturers in the past.With the FI 7160, Fujitsu have taken this to another level. Yes, the integration is a bit slow in the real process, but you can adjust it to appear only on certain scans. As you can see, the assisted scan lets you choose how a scan should output. Out of the 9 alternatives, you choose the one that suits you best. There is also a step size where you can change the variation from one alternative to the other. 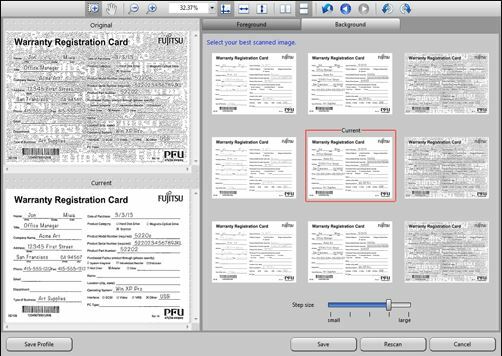 Another very cool feature in Paperstream IP is the Image Cleanup. 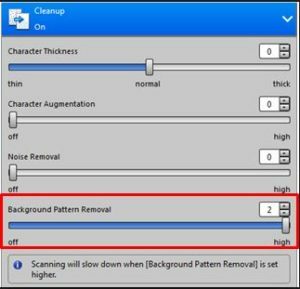 This is another function that let’s you improve your scanning process a lot. Way more features than just standard despeckle. Most of the people who have bought a scanner before knowing about Kofax. It is a software company developing scanner drivers and scanning software. Those who have bought Kofax before know just how much it can cost. For this Fujitsu Fi 7160 alone, a Kofax Express license would cost in excess of 1000 USD. That is more than the scanner. Reason for this is that Kofax licenses its software based on scanning speed. With the introduction of new machines, smaller, faster and cheaper, Kofax licenses can cost more than the scanner. This might seem strange to some of you, but I had to get used to it. Fujitsu is different though. While for a Canon or more expensive Kodak machines you need to either buy Kofax or software from Kodak, Fujitsu offers a free alternative. Canon also has a bundled software, but it is terrible. And when I mean terrible, you will definitely feel it is from another century. In the past we mean. That leaves Fujitsu with the PaperStream Capture. 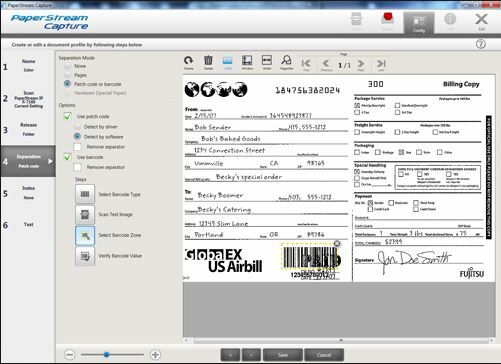 It does not have the same amount of features as the Kofax Express, but it is highly advanced, especially considering it is bundled with the Fujitsu scanners. So let’s go into some actual features of the software. The profile editor feature offers great settings. Besides those we mention below, we must point out that batch name, the creation of batch folders and special counters are available. It is a great tool for most scanning jobs. We can’t really think of many working environments where this software would not do the job. We have the basic driver settings for image quality and resolution. The advanced features are for separation and indexing. You can separate by barcode, patch code or verify the image value. Also, you can output indexed documents or full OCR directly. You can output just about any kind of file format you imagine. While JPEG, TIFF, and PDF are the usual suspects, the variations of those are very interesting. For example, you can output an OCR PDF directly. Yes, language is limited to about 20 types, but it is still a very nice feature. PDF/A the archival format is also there. The different compression levels for JPEG and TIFF can be adjusted. Same goes for PDF. Not to mention the basic option of SinglePage or Multipage is also included for TIFF and PDF. A great feature is multistream for file formats. Yes, you can output different file formats from the same scanning job. So if you need a TIFF master file but also a highly compressed PDF, you create a job profile for these and start scanning. You will generate 2 separate folders, or more, depending on your selection. This is another interesting option the scanner offers. You can either release your scanned jobs while scanning or you can release them after you finish the work. For example, you can for 2 hours. But you don’t want to release the job on the hard drive after each scan. Therefore you save the job and directly go and scan the next one. All the jobs are saved in the batch manager. After the 2 hours of scanning, you can release or complete the jobs. This way, you are not wasting time or computing power. You can also edit the jobs later if needed. You are using the time efficiently and you are just scanning. Fujitsu has made a great product. So good, that I think even they are regretting a bit. My personal opinion is that they were preparing for a tough battle with Canon, Kodak, and Panasonic. There were signs of a tough battle ahead, as everyone seemed to be “arming” in this sense. But in the end, the steps made by the rest were small and Fujitsu’s step was gigantic. You can’t beat the FI 7160 on price, quality, and features. Some years ago, a scanner with such bundled options would have easily cost 10 times more. But not anymore. The rest have to catch up. And very quickly. Because bang for the buck, this machine beats just about everything. How about photo scanning with this scanner? Go to our post on the best photo scanner with auto feed to find more information on this subject.